Police were called to the University of Aberdeen following reports that a group of protesters had thrown glitter over former MP George Galloway. The incident was said to have happened as Mr Galloway gave a talk in the university's New King's building. He tweeted that he had an "unknown substance in my eyes and lungs" but added later that he was "feeling better... just needed a good shower". Police confirmed they had been called to a disturbance at 19:45. Mr Galloway, who is from Dundee, also tweeted: "Someone calling themselves "Trans" and an "anarchist" led a five person attack on me on the platform at Aberdeen University. I continued." He also said on Twitter that his pregnant wife had leapt forward to defend him. A Police Scotland spokesman said officers had attended High Street in Old Aberdeen following reports of a disturbance. "Inquiries are at an early stage and no further details are available at this time," he said. 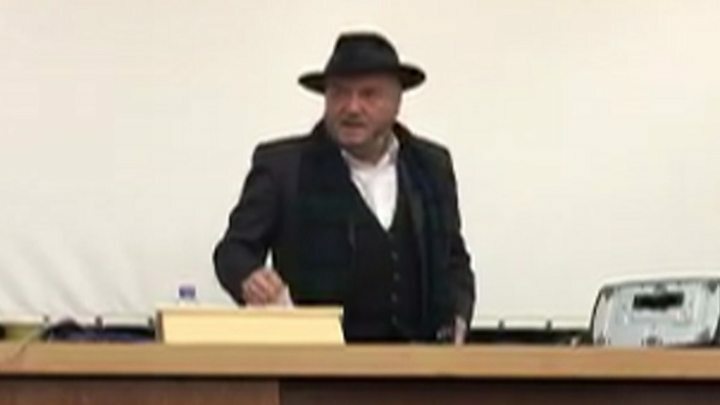 A University of Aberdeen spokesperson said: "George Galloway was invited to the university to speak to students by Aberdeen University Students' Association's International Relations Society. "At this event an incident occurred and the university is assisting police with their inquiries."